People in several countries including Malta are receiving unexpected phone calls on their mobile devices from different international telephone numbers as part of a massive, global scam with the objective to entice them to call back. These calls are typically dropped after one or two rings resulting in missed calls on the recipients’ phones. This characteristic has lent itself to the use of the industry term Wangiri, which translates to ‘one ring and cut’ in Japanese, to refer to such calls. The recipient is often fooled into making a return call to the number listed as a missed call. Do not return any missed calls from unidentified, international numbers. The scammers behind these calls mask their real identities and use automated systems to make high volumes of calls within a short time to several telephone numbers. Most people are left wondering how these scammers got hold of their phone numbers. Although there are different ways and means of sourcing phone numbers in general these scam calls are often made to sequential phone numbers within different number ranges. By targeting a whole block of numbers it is highly likely that a percentage of persons utilising numbers from the batch will return the call. The question is how does this benefit these scammers? The formulas vary, from them receiving cash returns for each call back to more invasive scams which lead the innocent parties to divulge personal and financial information and make them vulnerable to blackmail, fiscal loss or identity theft. No charges apply when one answers such calls while in Malta or while roaming in a country within the EU or EEA namely Iceland, Liechtenstein and Norway. However, international call charges generally apply if a person returns the call by redialling the international number. This is a pressing issue for mobile users and service providers globally are working and collaborating to combat these Wangiri scam calls. The moment awareness is raised that particular numbers or number ranges are being used for scam purposes, they act by blocking any outgoing calls to these numbers so that people would not be able to return calls to these numbers preventing further harm to their clients. 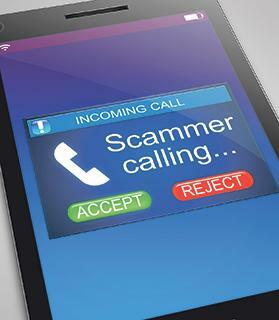 The Malta Communications Authority (MCA) has devised a process which all local telephony providers are subscribed to whereby as soon as a number or number range is identified as being utilised for scam calls, the information is shared among them in order to block outgoing calls to the identified number or number range. Although this is an effective measure, it is to be taken into consideration that the scammers behind these calls typically change the numbers very frequently to bypass this prevention mechanism. The MCA advises that those in receipt of unexpected calls from unidentified, international numbers follow a number of tips in order to protect their interests. First, do not answer calls from unidentified, international numbers immediately since many times these are dropped after a few rings. In the case of genuine calls, the caller would typically let the phone ring several times before dropping the call and would also re-attempt to call again if previous calls have not been answered. Also, do not return any missed calls from unidentified, international numbers. If a call is returned unintentionally, the caller should end the call as soon as possible to minimise the costs incurred. Also, one should under no circumstances disclose personal information over the phone. Block incoming calls from unidentified, international numbers using the phone’s blocking features. This will stop future incoming calls from the same numbers. Also, inform your telephony service provider of any unidentified, international numbers from which calls are being received. Service providers will make use of this information so that they may block outgoing calls to these numbers, thus preventing any harm to end-users who return such calls. Moreover, store international numbers of persons and entities you communicate with in your phone’s contact list. This would reduce the chance of mistaking calls from these numbers with unwanted calls. Deborah Pisani works at the Malta Communications Authority.